The Bible is of central importance within Caribbean life but is rarely used as an agent for social change. Caribbean biblical hermeneutics focus more on the meaning of biblical texts for today and less on the context in which the texts themselves were written. 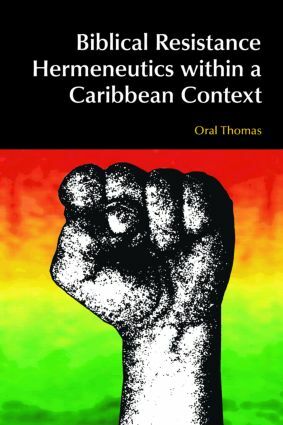 'Biblical Resistance Hermeneutics within a Caribbean Context' offers a biblical hermeneutic that acknowledges the importance of the socio-ideological interests, theological agendas, and social practices that produced the biblical texts, as well as the socio-cultural context of the contemporary reader. The book examines the social context of post-independence Caribbean and outlines the difficulties of biblical interpretation within Christian communities that descend from a history of slavery. Current hermeneutical practices in the Caribbean are critiqued and a biblical resistant reading offered that enables the Bible to be used as a cultural weapon of resistance. Oral Thomas is a Methodist minister in the Methodist Church in the Caribbean and the Americas (MCCA) and Lecturer in Biblical Studies and Theology at the United Theological College of the West Indies.